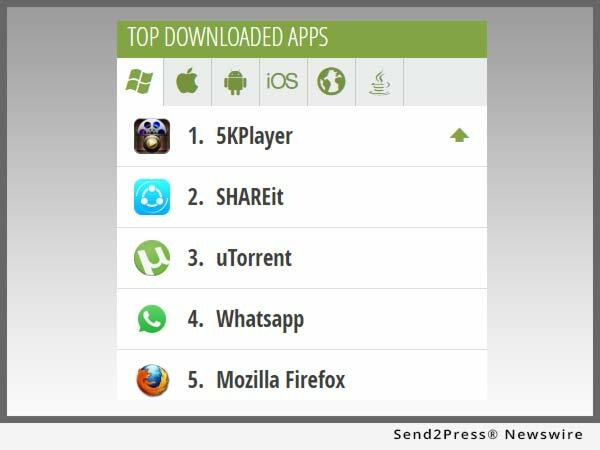 NEW YORK CITY, N.Y., Feb. 16, 2017 (SEND2PRESS NEWSWIRE) — Dearmob’s 5KPlayer today kicks SHAREit off its throne on Softonic front-page top download list, leaving the old tycoon – SHAREit in the second place, followed by uTorrent, Whatsapp, and Mozilla Firefox. To celebrate, 5KPlayer joined with Digiarty offers every user the first HD Video Converter Giveaway campaign 2017: https://www.5kplayer.com/software/win-free-copy.htm — limited 20 copies are offered every day. "The integration of 3D HEVC and 8K 4K video playback, online music movie download and iOS 10 AirPlay mirroring and recording is a very practical idea to facilitate user experience, and 5KPlayer claims to make persistent effort in refining each utility," says Houston Xu, the product manager of Dearmob. DearMob, Inc., a vigorous software company with a forward-looking vision, keeps pushing itself in developing new products and revamping 5KPlayer's capability. With a foothold in mobile solutions, media playback, online video download, and AirPlay in 2016, DearMob is ready to enable more dynamic growth with compact and competitive products to Mac/Windows/iOS/Android users in the year 2017. RSS News Feed for DearMob Inc.